The Luskin Conference Center is one of nine buildings at UCLA that hold LEED Platinum certification. The UCLA Meyer and Renee Luskin Conference Center has been recognized for its commitment to sustainability with two new accolades. 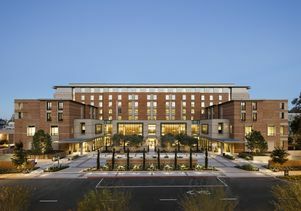 The 295,000-square-foot conference center, which opened on campus in August 2016 and has 254 guest rooms for overnight accommodations, was recently named California’s second LEED Platinum certified building of its kind, and the sixth newly constructed venue of its kind in the nation to be certified LEED Platinum by the U.S. Green Building Council. Sustainability, indoor environmental quality, innovation in design and energy and atmosphere were listed among the building’s highest performing strengths. LEED is the building council’s rating system for designing and constructing the world’s most energy-efficient buildings, and platinum is LEED’s highest distinction. The conference center is one of more than 30 LEED certified buildings at UCLA, including nine that hold platinum certification. The Luskin Conference Center, designed by Hornberger + Worstell, was also honored with the Sustainability Award at the 47th Annual Los Angeles Architectural Awards, held June 22. The awards, presented by the Los Angeles Business Council during a ceremony at the Beverly Hilton, recognized 45 winning projects from a pool of more than 200 nominees. The event was attended by leading design and building professionals, as well as top city officials. Winners were selected by a jury representing a cross-section of industry experts, including representatives from top architectural firms, Los Angeles city government, developers and engineers. This is not the first time a UCLA building project has been recognized at this yearly celebration of architectural innovation and design. In 2014, the UCLA Teaching and Learning Center for Health Sciences, now known as Geffen Hall, received the Under Construction Award. 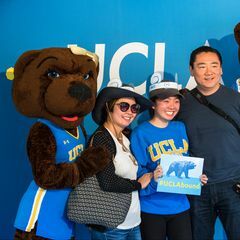 In 2016, the Evelyn and Mo Ostin Music Center received the Education Award and in 2015 the UCLA Hitch Suites received the Housing Award. Additionally this achievement will reflect Meyer and Renee Luskin’s commitment to preserving the environment and promoting the development of a more sustainable society, Angelis said. 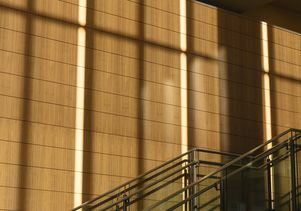 Among the environmentally sustainable features of the building are its large windows, which allow natural light to stream into the building; drought-tolerant landscaping that features a variety of native plants; the building’s structural steel frame that was made using more than 90 percent recycled material; wood paneling sourced from sustainably managed forests; and locally manufactured exterior brick. Visitors and guests learn about the conference center’s sustainability commitments through formal communications, as well as sustainably minded operational practices, Angelis said. 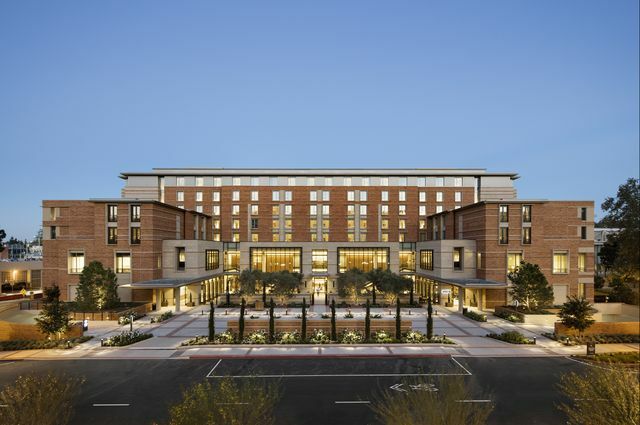 Information on the Luskin Conference Center’s sustainability commitments, such as its carbon neutrality and zero waste goals, are included in the in-room guest information booklet. Guests are encouraged to contribute to these efforts by participating in the towel reuse program and composting their waste. 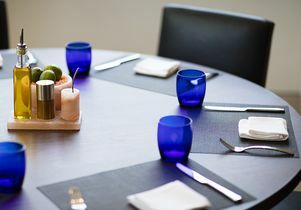 Additionally, operational features, such as the all-electric vehicle fleet, use of plant-based shower amenities, and linen-less banquet set ups reinforce the center’s commitment to integrating sustainable practices at all levels of the operation. 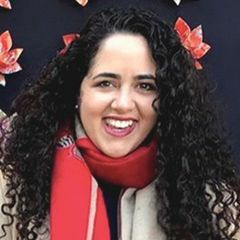 “The Luskin Conference Center’s interest in shifting the paradigm and innovating new ways of conducting business sets us apart in the marketplace and demonstrates to the hospitality industry that sustainability fulfills the triple bottom line of benefitting people, planet and profit,” Angelis said. The Luskin Conference Center is currently pursuing the Green Seal certification for Hotels and Lodging Properties, which will complement its LEED certification by addressing day-to-day operational practices, such as purchasing, waste management, and water conservation, said Angelis, adding that the Luskin Center aims to become the first university-owned conference center to achieve a Green Seal certification. UCLA Meyer and Renee Luskin Conference Center. 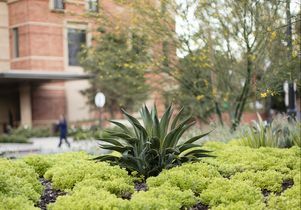 Landscaping around the Luskin Conference Center features California-friendly, drought-tolerant plants. Previous Story UCLA faculty voice: Why big business keeps winning at the Supreme Court Next Story Cracking the code: Why aren't more women majoring in computer science?